15 November is a date to look out for at the Barbican in London. There are two concerts combining jazz with film. At 16:00, and billed as ‘the perfect Jazz festival event for families’, the Millennial Territory Orchestra, led by Steve Bernstein, play new scores to three Laurel and Hardy silents: Sugar Daddies, Double Whoopee and Wrong Again. Then at 20:00 American jazz guitarist Bill Frisell, with Tony Scherr (bass) and Kenny Wollesen (drums) play Frisell’s scores to Buster Keaton’s High Sign and One Week, as well accompanying animations by ‘maverick cartoonist’ Jim Woodring and The Mesmerist by avant garde artist Bill Morrison (best known for the found silent footage film Decasia). 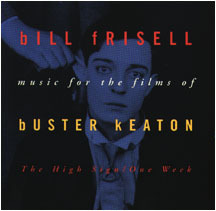 The Bioscope admits to being a huge Bill Frisell fan, but has always had a problem with his Keaton scores, which seem uncomfortably disconnected to the action of the films – scores which pick up a wistful Americana which is a Frisell hallmark, but which are expressions of an idea of the film rather than credible accompaniments to the films themselves. But we’ve not had a chance actually to see the films matched to the scores, so there may be hope for revelation in live performance. More details on both concerts from the Barbican Jazz site. Frisell has produced two CDs of his Keaton scores: Go West, and The High Sign/One Week.